Gaining a strong sense of signals and systems fundamentals is key for general proficiency in any electronic engineering discipline, and critical for specialists in signal processing, communication, and control. At the same time, there is a pressing need to gain mastery of these concepts quickly, and in a manner that will be immediately applicable in the real word. Simultaneous study of both continuous and discrete signals and systems presents a much easy path to understanding signals and systems analysis. 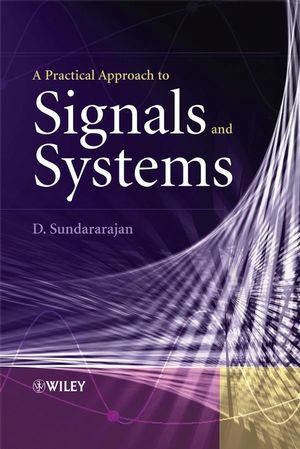 In A Practical Approach to Signals and Systems, Sundararajan details the discrete version first followed by the corresponding continuous version for each topic, as discrete signals and systems are more often used in practice and their concepts are relatively easier to understand. In addition to examples of typical applications of analysis methods, the author gives comprehensive coverage of transform methods, emphasizing practical methods of analysis and physical interpretations of concepts. A Practical Approach to Signals and Systems is an excellent resource for the electrical engineering student or professional to quickly gain an understanding of signal analysis concepts - concepts which all electrical engineers will eventually encounter no matter what their specialization. For aspiring engineers in signal processing, communication, and control, the topics presented will form a sound foundation to their future study, while allowing them to quickly move on to more advanced topics in the area. Scientists in chemical, mechanical, and biomedical areas will also benefit from this book, as increasing overlap with electrical engineering solutions and applications will require a working understanding of signals. Compact and self contained, A Practical Approach to Signals and Systems be used for courses or self-study, or as a reference book. D. Sundararajan is a consultant in digital signal processing at NewTech Software Pt. Ltd in Bangalore India. He has taught undergraduate and graduate classes in digital signal processing, engineering mathematics, programming, operating systems and digital logic design at Concordia University, Canada and Nanyang Technological Institute, Singapore. Sundararajan is the principal inventor of the latest family of Discrete Fourier Transform (DFT) algorithms, and has published two books on DFT and related areas. He also wrote a lab manual for the Digital Electronics Course at Concordia University, and has three patents in fast Fourier transforms. Over the course of his engineering career he has held positions at the National Aerospace Laboratory, Bangalore, the National Physical Laboratory, New Delhi, working on the design of digital and analog signal processing systems. Sundararajan holds a B.E. in Electrical Engineering from Madras University, an M.Tech in Electrical Engineering from IIT Chennai, and a Ph.D. in the same from Concordia University.